SpecificationsMaterialmetalColorsilver, blackRod length29cmStand size150x80x7mmComposionbase, iron rod, flask holder, siderosphere(with Fixing clip)Application it is suitable for the use of schools, factories, scientificresearch units, families, hospitals, laboratories, laboratory. These non-corrosive, moulded retort stands provide excellent replacement for the metal ones. Even the metallic rod has a polypropylene covering making it non-corrosive. The rod measuring 12. 5 mm X 750 mm can be screwed into the heavy base giving way to a perfectly stable stable retort stand. We are successfully ranked amongst the topnotch entity offering a wide range of Bases Retort Stand. The offered stand is manufactured using heavy cast iron along with stove enamel finish and threaded hole for rods. 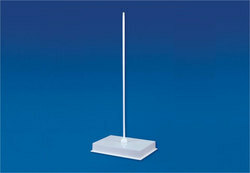 Glass Agencies EROSE are Manufacturer of Retort Stand. These non-corrosive, moulded retort stands provide excellent replacement for the metal ones. Even the metallic rod has a polypropylene covering making it non-corrosive. The rod measuring 12.5 mm x 750 mm can be screwedinto the heavy base giving way to a perfectly stable Retort Stand. Made of cast iron and powder coated base with mild steel (M.S) chrome plated rod. Our organization is committed to deliver qualitative assortment and therefore, engaged in offering optimum grade spectrum of Retort Stand. We are engaged in offering Retort Stands to our clients. Our retort stands find wide application in clinics, hospitals and research labs. its having study base of C.I. level to mount of table, painted in black water proof synthetic enamal paint and rod in Aluminium paint finish. Its having Triangular base of C.I. available in 3 size. These non-corrosive, molded Retort Stands provide excellent replacement for the metal ones. Even the metallic rod has a polypropylene covering making it non-corrosive. The rod measuring 12.5 mm x 750 mm can be screwed into the heavy base giving way to a perfectly stable Retort Stand. Cast iron rectangular base with stove hammertone painted with hole. 12.5 dia M.S. chrome plated one end half round and other end machine threaded with washer and hexagonal nut. Keeping in mind ever-evolving requirements of our respected clients, we are trading a premium quality range of Retort Stand. Rectangular, complete with rod, base made of mild steel plate with hammer finish and hole. Iron rod 12.5 mm dia. and nickel-plated provided with locked pin for extra tightening of rod. Base fitted with leveling screw and feet.